Here, 11 great corn salad recipes. Now that you know the fastest, simplest way to cut corn kernels off the cob (thanks to this week’s Mad Genius Tips video), corn salads are a breeze. They’re also the perfect, portable dish to bring to summer cookouts. Here, 11 great corn salad recipes. This fast-and-easy warm salad is sweet, spicy, tangy and ready in just 30 minutes. In this riff on corn chowder, corn is tossed with potatoes, bacon and cider vinegar. This spicy fresh-corn salad, with grilled sweet Vidalia onions and tart lime juice, is a perfect picnic dish. The perfect farmers’ market salad. At its peak, fresh corn is delicious raw, straight off the cob. It’s even better tossed with radishes and a puckery lime dressing. 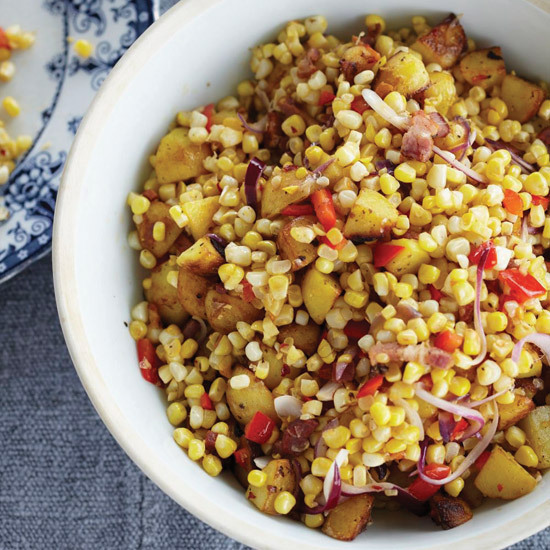 This no-fuss salad mixes roasted corn with potatoes in a creamy, slightly spicy dressing for a distinctive and flavorful combination. Both the corn and the peppers are grilled for this terrific salad. This crunchy, colorful salad pairs blanched corn and green beans with an incredible dressing for a great throw-together meal. For an ultra-simple salad, toss peppery arugula with fresh corn and lots of feta cheese. Cook buttery tilapia and corn together, then add a dose of crunch with onions, capers and cherry tomatoes for a great salad. This fantastic summer salad with sweet corn, healthful bulgur and pops of fresh lemon juice is the perfect accompaniment to a grilled dinner.